“The deadline for submitting testimony regarding the Public Hearing on DEEP’s budget is Monday March 2, 2015. Note that “testimony” does not mean you wish to speak. Testimony can be in written form only and sent via email to (SC’s words: please cut and paste this email address: apptestimony@cga.ct.gov). Note that the committee prefers to receive email testimony as an attachment to the email, preferably in pdf form (although MS Word form should suffice). Attached is my updated testimony in pdf form which you may use all, or part of, in your message. Just be sure to replace my name & address with your own. Note that your message can be very short, but it’s important at this time to get as many people as possible writing to support keeping Kensington Hatchery operational. 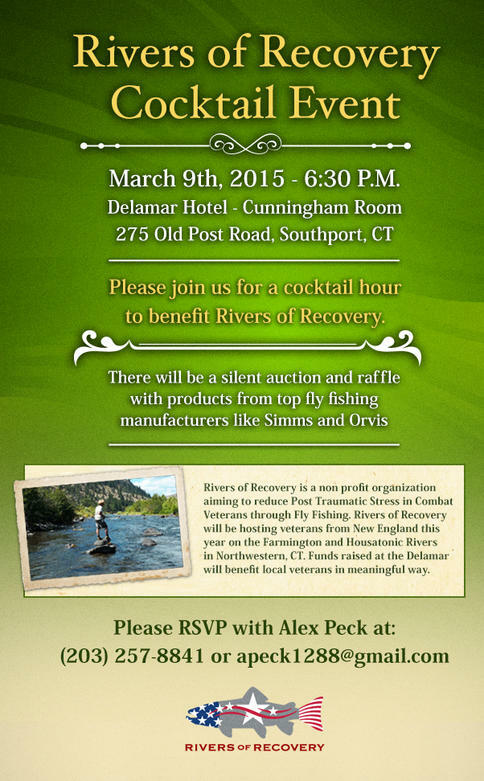 “Hi All, A few of us are throwing together a fundraiser for Rivers Of Recovery at 6:30 on March 9th at the Delamar Hotel in Southport. Rivers of Recovery is a non profit organization that brings veterans of the wars in Iraq and Afghanistan fly fishing throughout the country. I think a lot of you know the healing properties of fly fishing and the program has certainly helped me a ton. You can read more about Dan’s story in the winter issue of Anglers Journal. First and foremost: the venue has changed. The meeting will be in the large banquet room of the Whinstone Tavern at Stanley Golf Course, 245 Hartford Rd., New Britain, CT. I think doors open at 6:30 and the meeting starts at 7:00. I assume there will be an update on the FVTU website, fvtu.org. 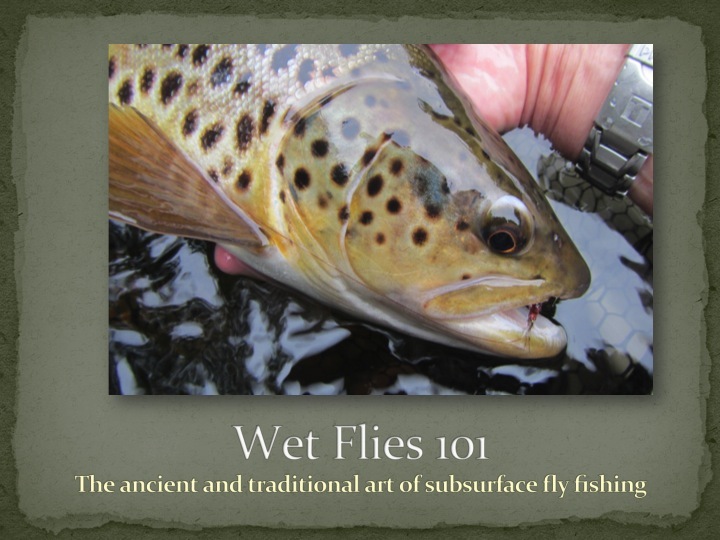 The Program: Wet Flies 101 – The ancient and traditional art of subsurface fly fishing. Wet flies have been taking trout for centuries — and the fish aren’t getting any smarter. 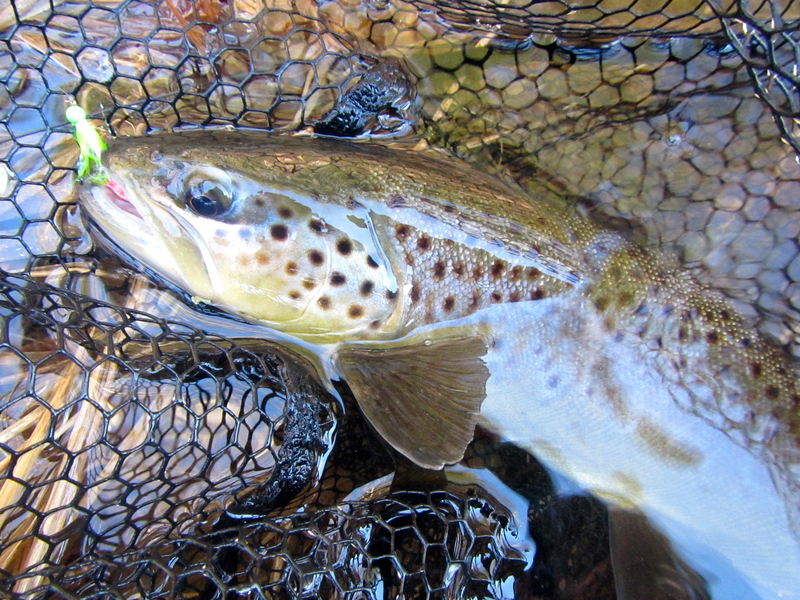 More and more anglers are discovering that a wet fly is often the best way to match a hatch. Explore the wonders of the wet fly as we cover basics like wet fly types, leader construction, where to fish wet flies, and how to fish them. If you want to see the other nineteen slides, you gotta come to the presentation. The striper grandmaster talks about setting the hook, playing big fish, the effects of pressure, and fear. Ken Abrames is one of the most revered names in saltwater fly fishing. 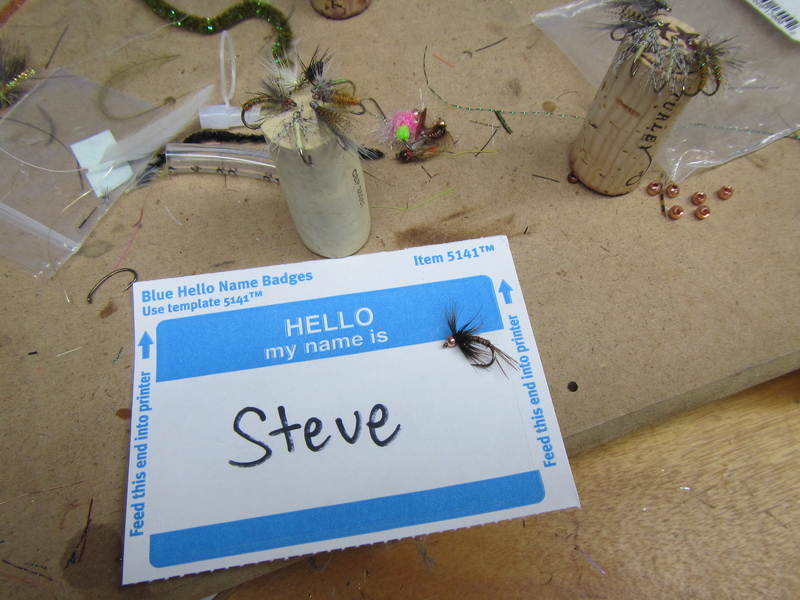 He is the creator of the modern flatwing streamer, presentation-style flies that can imitate everything from clamworms to menhaden. His books Striper Moon and A Perfect Fish belong on the shelves of anyone who is an aficionado of traditional New England striped bass fly tying and fishing methods. 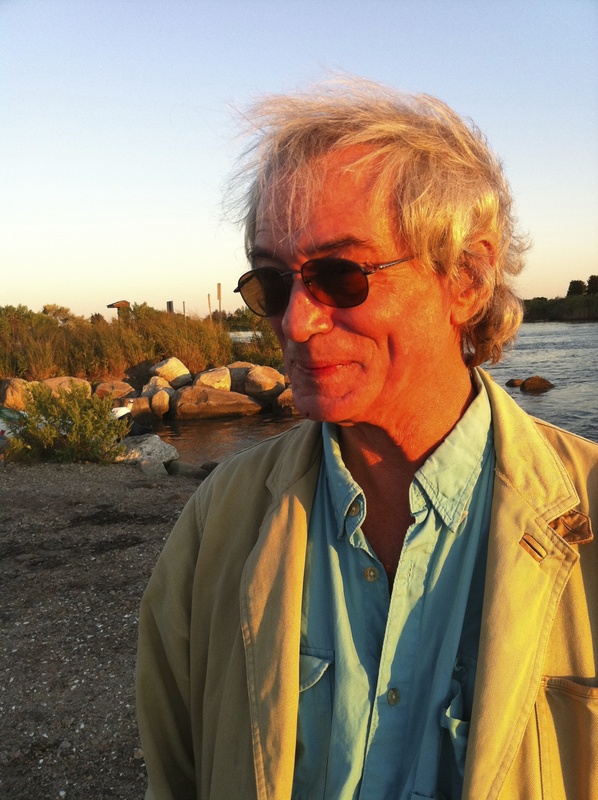 Besides being a world-class angler, Ken is also a rod designer, author, poet, and artist. I have the good fortune to be able to talk fishing with Ken on a regular basis. He is funny, candid, a good storyteller, and highly experienced. Here is an excerpt from one of our conversations. Ken: It’s so hard to set the hook when a fish is screaming off line. People think they’re hooked up. But the fact of the matter is, you need to set the hook. And if you don’t, as soon as he makes his first turn, it’s over. Currentseams: That is exactly what happened to me this spring. I had a big striper blow up on a flatwing and I didn’t set the hook. So if you don’t get a good initial hookset, you have nothing to lose by trying to reset during that first run. Currentseams: When you first started teaching me, you drilled into me, as a fundamental part of fly fishing for stripers, the practice of hitting that fish multiple times. Ken: If you hit him three times, sometimes you still lose him. If you hit him four times, sometimes you lose him. If you hit him five times, you won’t lose him. Currentseams: Talk about a sharp hook being the single most important thing in fishing. Ken: Well, it is the single most important thing. Because all those things you hear – the fish struck short, the fish were playing, there’s too much bait in the water, those little taps are small fish – those are just excuses people make up because they don’t understand why they’re not hooking up. And the only thing that is necessary is a needle sharp hook. Once you have that, once you feel the pressure of the fish, the hook has already started in. Ken: Think of the inside of a striper’s mouth as your fingernail. You take a hook and you run it across the back of your thumbnail. If it doesn’t stick in, or stick to your nail like a piece of scotch tape, it’s not sticky sharp. And the same thing will happen inside a fish’s mouth. A hook that isn’t sticky sharp will slide right out. Currentseams: Let’s talk about those little taps. Ken: When you feel that little tap, that’s a fish. He just sucked in your fly. If you’re used to casting and retrieving, like with a spinning rod, you expect a big yank. But the fact of the matter is that it is often just a tiny little touch, or even just a change in pressure. And to be aware of that is one of the most important things you can learn. You have to develop it as a skill. Currentseams: If you’re taking a simple cast-and-retrieve approach to fly fishing, when you feel those little blip hits, and miss the fish, are you just simply pulling the fly out of the fish’s mouth? Ken: Yep. You are. Fish don’t make mistakes. Currentseams: Fighting a 30-pound bass is different from fighting a 10-pound bass. Let’s talk about that. Ken: The first thing is to not be afraid that you’re going to lose the fish. The other thing is to not try to stop him when he runs. Say you’re a sprinter, and you’re running the 100-yard dash. What’s the first thing your body does when the race is over? Ken: That’s what the fish does, too. At that moment when the fish reaches the end of his run, that fish is exhausted. Now I know this is true because I have caught so many fish in my life, it’s ridiculous. When I fished commercially for stripers, I would hook a fish, and he would run, and I would run my boat right after him. At the end of the run, the fish would come up near the surface on his side. He was exhausted. It would only take about three minutes. Didn’t make any difference if he was thirty pounds or fifty pounds. You understand? Ken: OK, so now a guy hooks a big fish, it runs like hell, and he wants to stop the fish. And he puts pressure on the fish, and he thinks he’s going to turn it. That’s ridiculous. Take the pressure off the fish and it will stop (laughs knowingly). You have to learn this. Fish don’t read books about what they’re supposed to do and not do. They do all kinds of things besides what I’m saying. When the fish stops running, you reel in nice and steady, keeping the pressure the same, and the fish will come in like a dog on a leash. It’s like you hypnotize him with that steady pressure. If he wants to run again, back off the handle and let him. Currentseams: Some anglers overplay stripers. Ken: They don’t put any pressure on the fish because they’re afraid something bad is going to happen. Fear is the deciding factor. As long as you’re afraid, you’re not going to learn anything, and you’re going to make the same mistakes over and over again. Currentseams: So some things that help you be less afraid are sharp hooks and, would you say, strong leader? Ken: Oh, absolutely. Throw away all these ideas about fish seeing leaders and all that crap. Some people think I’m speaking heresy, but it’s not heresy. It’s the truth. Currentseams: I haven’t used anything other than thirty, twenty-five, and twenty-pound Worldwide Sportsman mono for years now. Ken: Of course. If you’re worried about leaders, you’re going to have a built-in handicap. You’re going to catch a hell of a lot more stripers on thirty pound than you are on eight. Currentseams: I’ve found very few situations where I felt my leader color or size was the reason I wasn’t catching. Ken: The leader isn’t an invisible connection. It leads the fly. You’ve got to match the size of the leader to your fly so it will swim right. You want the fly to be presented in a certain way. The leader is about the mechanics of presentation, not invisibility. You know that mono you’re using? That’s the original mono. The first one that was ever made. Do you get it? Ken: They haven’t improved it. But they’ve found millions of ways to sell other different kinds. Currentseams: Do you keep your drag ratcheted down tight? Ken: I use my hands. My hands are my drag. I don’t want anything between me and the fish. I just keep my drag tight enough so that the reel doesn’t over spin. Currentseams: Too many anglers let stripers take them into their backing. I’ve only gone backing with three or four stripers in my life. Ken: This is a true story. And it was witnessed by two people. I was fishing off Watch Hill in a boat for false albacore with a seven-weight rod and a fifteen pound leader. I hooked a fish, let him run, then held him and held him until the leader popped. So I said, oh, okay. I tied on another fly. Then I caught forty-two albacore. And not one of them got into my backing. Not one. Because I knew exactly how hard to push. Ken: I kept ten of them, and told people they were good to eat – even though everyone says they’re not – and I lied, because I wanted to find out if they were good to eat. Everyone was disappointed (laughs). Ken: I don’t care about the rules, and about what everybody else does. I always want to find out for myself. I also caught a couple of false albacore that day on my spinning rod. Know what I caught them on? Ken: Plastic crawfish with blue claws (laughs). Ken: I have no theories. I’m just talking about experience. Currentseams: …the more line or backing that’s out, the more things can go wrong. Ken: Well, yeah. The only thing you want to do is break the fish’s spirit. Currentseams: What about swinging your bent rod from horizon to horizon to keep the fish off balance? I’ve done that with steelhead, and sometimes stripers. Ken: You can absolutely change the direction of a fish by moving your rod. If you put your rod down close to the water, you let the line cushion your leader. You can change a fish’s direction by backing right off the pressure. If the fish runs downstream, you can dump line into the current, and let it get below the fish. Then all of a sudden the fish feels the pull from downstream, and he’ll start swimming up, dragging that line right behind him. I’ve done that hundreds of times. Currentseams: That seems counterintuitive: if you take the pressure off the fish, you’ll lose the fish. Ken: The line in the water will keep it tight. 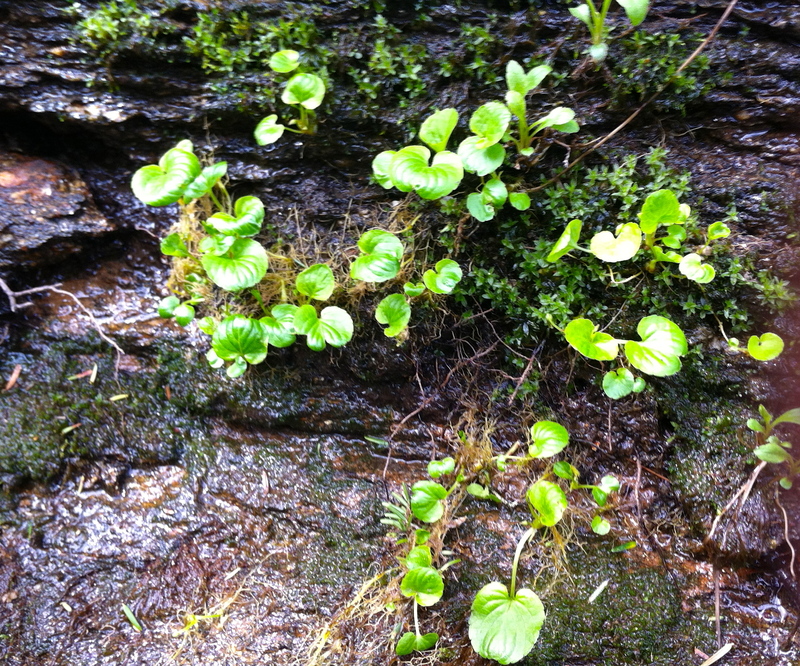 Currentseams: I get it now, but I worry when a fish runs downstream, then makes an abrupt turn and speeds upstream. Ken: A fish running upstream means somehow the drag of the line got below him. The fish always goes against the pull. Mmm-hmm. Currentseams: What are some of the bigger stripers you’ve caught on a fly rod? Ken: Oh God…I’ve caught a lot of big fish. A lot of people have caught a lot of really big fish on flatwings, because they really are a big fish fly. And they’re castable, and they can imitate anything. Currentseams: Are there any kind of basic strategies for targeting big fish? Ken: Well yeah, there are, but you have to learn those things over time. And you can’t be listening to other people. Currentseams: How about how to fight a big fish? Ken: You fight the fish from the first guide closest to the reel. The rest of the rod is not important. That angle from that guide is the most power you’re going to get. And you use the rod to dampen that power – if you raise the rod, it lessens the drag and reduces the pressure. Reason can’t fish. You fight the fish with your gut – you don’t play it from your head. Most people have fear in their gut. And fear always comes from an idea. Currentseams: I still have a certain amount of fear with any big fish, but it doesn’t inhibit me. Since I started resetting the hook like you taught me, I have not lost a striper over 28”. Ken: (laughs) I know what a big one feels like. Ken: And that’s the truth. Some people just refuse to give up their reason. Everything has to have a cause and an effect. The fact of the matter is that the future is unwritten. You can’t get there by figuring out the past. It’s always now. Snow. Cold. More snow. More cold. Ditto, ditto, et cetera, et cetera. Stand sure, folks. Spring’s coming. You can see it on the trees — just look at all those buds. If you have forsythia, the stalks are green and the buds are very well-formed, even in this ponderous sub-Arctic snow-making nonsense. By the numbers, we are just over one week away from March. Eight weeks away from Opening Day (in case you still use that as a marker). Hendricksons will be hot on its heels. And stripers will be on the move well before that. Hopefully you’re keeping busy doing some reading or tying flies. I’ve just been busy. But I am working on some new material for the site that I hope to have out soon. As always, thanks for reading, and thanks for following currentseams. Wearin’ of the green. From May last year. Hope to see you at the Compleat Angler, 541 Post Road in Darien, Saturday, February 28 from 10am-2pm. Like the title says, steelhead soft-hackles and fuzzy nymphs will be the bill of fare. Many of these patterns cross over neatly into trout fishing, so don’t let the steelhead designation scare you off. This is a tying demo, not a class, so all you need to bring is yourself and some questions if you are so inclined to ask. I will certainly be tying some of the flies that were featured in my “Soft-Hackles for Winter Steelhead” piece in the last issue of American Angler. Till then, stay warm! The Ginger Spider. Yup. It would be safe to say that I have a thing for the magical material humbly known as ginger Angora goat. Teal flank, too. Arrival, ten minutes before class. One of my students pulls into the space next to me and greets me with, “It’s the professor.” The first thing that goes through my head is, red tail, yellow floss body, gold tinsel rib, brown hackle, mallard wing. Yes. I am a fly pattern nerd. Introductions are made, and name tags are filled out. I have a pathological flaw when it comes to remembering names. I don’t know who who thought of the concept of “Hello, my name is,” but whoever you are, I don’t think the word “genius” is an excessive blandishment. I have seven students. They ask many questions. Some of my answers are too long, and stray down labyrinthine anecdotal paths. But everyone seems interested. Thank God for captive audiences. All fly tiers are not created equal, and in any given class you have a broad range of skill levels. 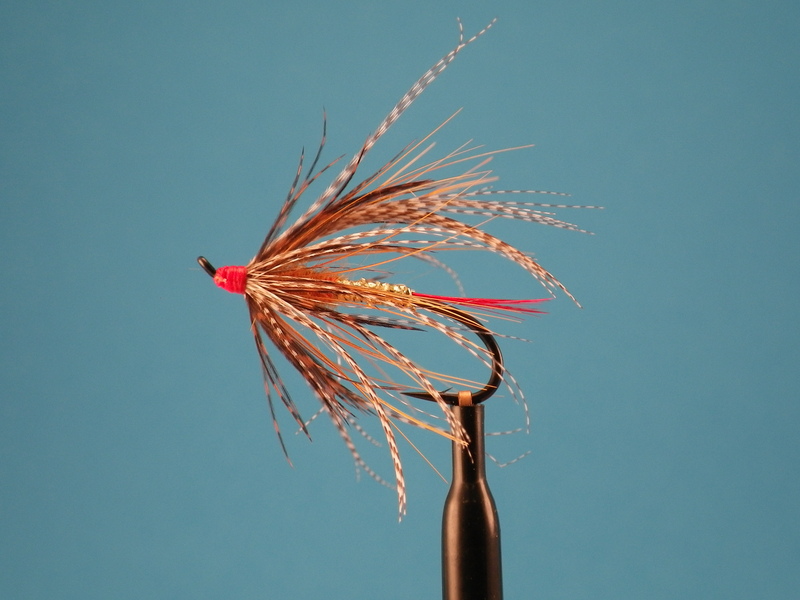 I look at some of the finished flies, and they will never grace the pages of a fly tying magazine. But, so what? To a trout, they will be beautiful. And that is all that matters. I also notice that some of the tiers are making significant improvements over the course of a couple hours. I would like to take credit for this, but I really can’t. I comes from within the tier. Still, it is gratifying to witness. And then, we’re done. Seven flies (Partridge and Cahill, Drowned Ant, BWO Spider, Dark Hendrickson, Squirrel and Ginger, Ginger Caddis Larva, Pale Water Wingless) in a little over four-and-a-half hours. Thank you, gentlemen, for letting me be your instructor (and well done, all of you!). Thank you, UpCountry, for letting me teach. And thank you, Mother Nature, for saving the snow until Monday.